Just as the candidates tournament was heating up, so were our Friday night quads. After two rounds all four players in the top section were tied with 1 point and all of the final round games seemed even. If both games finished in a draw then for the first time ever, there would have been a four way tie for first in one of our quads! 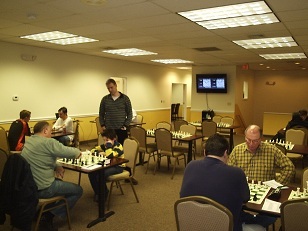 However, it was not to be as both FM Leif Pressman and NM Ian Harris managed to win their games and tie for first. Alex Eydelman swept the swiss section but it was Leo Koganov who stole the show. Leo beat Melvin Patrick (rated nearly 700 points higher) and Robert Steindorf (400 points higher) to pick up 150 rating points! Join us next week for some more exciting chess!